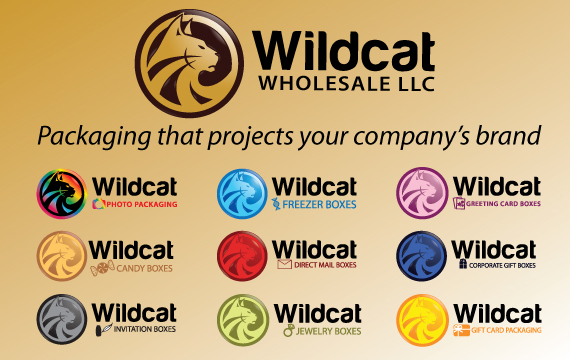 To the casual web browser, Wildcat Wholesale LLC appears to be a packaging supplier. This observation is true, but when you look closer, you'll realize we're so much more. Wildcat was founded in 2006. Almost immediately we realized there was a need for good packaging suppliers in a variety of uniquely diverse industries. There were no suppliers that specialized in corporate branding. So we broke apart the business into smaller, uniquely diverse sections. Each section offering products designed to lead that industry's packaging market. Each section designed to make your buying experience quick and easy. Each section designed to be the best packaging supplier in your industry by offering the most affordable, top quality products that project your brand. We even developed the technology to provide full color printed items by the case at affordable prices. This is not one color foil stamping or laser engraving, and you don't need to order hundreds at a time. It's CMYK, process printing in full color, and there is a 1 case minimum! You can finally project your brand affordably with your packaging. You're not limited by the artwork we can print on your products. And you can afford it because of our 1 case minimum quantity. Your options are truly limitless! We make most of our products right here in Avon, Ohio. Made in U.S.A.! We ship to over 190 countries around the world via UPS or the U.S. Postal Service. Larger orders can be shipped by our less than truckload (LTL) carriers so we can extend to you the best freight discount. Thanks for visiting our website. We hope we've lived up to our promise to provide packaging products that project your company's brand perfectly. We add new products all the time, so check back often.